80,000 kms. 40 countries. One year. Heart-warming stories of life on the road from this couple in their late fifties who decided to live the dream and ride their KTM motorcycles round the world. The colours, tastes and emotions are brought to life in this wonderful expose of words and photos. The technical information is invaluable for anyone setting off on an overland journey and the list of 150 of the best motorcycle roads is an added bonus. This book is about declaring you are going to do something amazing, and actually seeing it through. What makes a couple in their late 50s, living a perfectly good life in Brisbane Australia, decide they will take time out and ride their motorbikes around the world? The key question for Paul and Lee though was ‘Why not?’. Inspired by other global overlanders, they spent a year planning and another year circumnavigating the globe, as it seemed obvious to travel in one direction. Avoiding most major cities as they travelled, this became more than just a ride. Encounters with amazing people, incredible scenery most travellers never see, food both delicious and questionable, serious accidents, and breakdowns in strange places make this a riveting yarn. And the beer! Let’s not forget that. 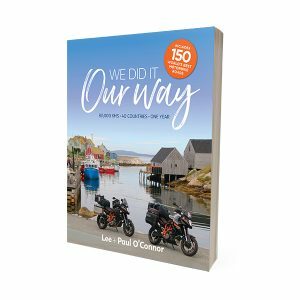 Paul and Lee’s great stories, incredible images and shared practical resources will pull you in to their journey, and inspire you to dream, plan and take the next step towards the adventure of your lifetime. This is a very good book and a great read – not only for motorcyclists but also for those interested in travel or planning a trip. There are many photos and stories that will keep the reader going back to this book. Also a bonus for those interested in food from various countries – the recipes that are included. The last couple of chapters contains a wealth of information on planning, what the writers took, costs – fuel and accommodation, best roads etc. This is not a book you will read once and put in the book case – it is both an interesting journey with Lee + Paul as well as a useful trip planning reference. Great book! Beautiful photos and interesting stories of far away places.